The chief executive of a major polling organization suggested that open-border laws currently in effect in the United States could attract up to 42 million Latin Americans to migrate to the United States. Jim Clifton, chairman and CEO at Gallup, made the suggestion in a commentary about the results of the pollster’s global migration survey, which found that 42 million people in Latin America and 158 million adults worldwide want to permanently move to the United States. The results of the poll drew the attention of President Donald Trump, who is at an impasse with Democrats in Congress over funding for a wall on the southwest border and comprehensive immigration reform. 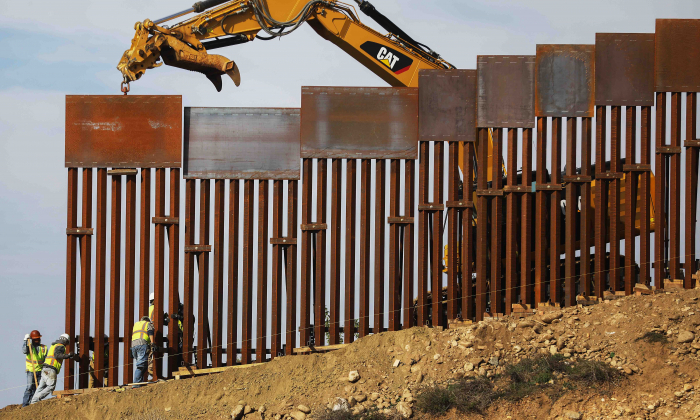 Trump is demanding $5.7 billion for construction of a border wall as part of a larger border security package requested by experts from the Department of Homeland Security. Democrats so far have blocked the president from securing any funds. “This would be a disaster for the U.S. We need the Wall now!” Trump wrote on Twitter on Feb. 10. Late last year, Trump triggered a partial government shutdown by following through on a warning that he would not sign a government funding bill unless it included funds for a border wall. The shutdown stretched into the new year and became the longest in U.S. history. Trump ended the shutdown by agreeing to a three-week government reopening, during which lawmakers from both parties would work on a compromise bill. The three-week window ends Feb. 15. In a pair of follow-up messages on Feb. 10, the president said that Democrats are offering a small sum for the border wall. Trump also said the Democrats are making last-minute demands. “I don’t think the Dems on the Border Committee are being allowed by their leaders to make a deal. They are offering very little money for the desperately needed Border Wall & now, out of the blue, want a cap on convicted violent felons to be held in detention!” Trump wrote. The United States remains the most popular destination for people who want to permanently leave their countries. The second most popular destination, Canada, was more than three times less popular, according to Gallup. Overall, the number of people who want to permanently leave their countries rose to 15 percent in the period 2015-2017, from 13 percent in 2010-2012. It was still unclear on Feb. 10 whether lawmakers could reach a compromise acceptable to both Trump and Democrats. House Speaker Nancy Pelosi has said that she is against any measure that includes funds for the president’s landmark campaign promise. Trump has suggested that he would use his executive power to fund the wall’s construction if lawmakers fail to come up with a bill that includes it.